Indianna is a recent Screen Production graduate from Flinders University, Adelaide, with a passion for the creative arts, writing and film. For several years she has also worked as an in-home carer for two brothers with Autism Spectrum Disorder (ASD). Through her work she noticed that there is a lack of educational material for young siblings and peers of children with ASD. 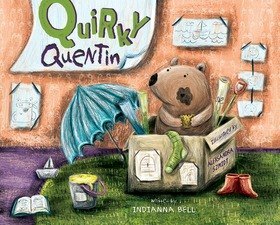 Being a difficult concept for young children to understand, she began to develop Quirky Quentin as a way of motivating kids to draw similarities between themselves and those they know on the spectrum. She hopes that this book will promote understanding and awareness of such a common and diverse disorder, and will encourage children to celebrate the joy in being different.